Terris’s work spans a variety of media, including sculpture, performance, installation, and photography – allowing him to examine the relationship between constructed architectural spaces and our common experiences and encounters within them. He is interested in exploring how repetitive patterns in planning and design become subconscious cues for social conduct. Through an amplification or shift in the primary function of an initial design, he reconsiders utility in both object and place and challenges perception and interaction within public space. Recent works include Another False Front at Western Front Gallery in Vancouver (2009), an architectural intervention where an adaptation of the existing western false front (or commercial false front) has been added to in order to emphasize Vancouver’s long running upswing in the real estate market and subsequent boom economy. Ought Apartment, commissioned by and installed at the Vancouver Art Gallery (2009) was a six-storey installation featuring six fullscale apartments stacked one upon the other. Each apartment level was fully furnished exclusively with original items from the 1950s though to the present decade and included a kitchen, living room and bathroom. Each floor represented the look of a particular decade, becoming emblematic of that period’s interior design and domestic living, and calling attention to the cyclical nature of fashion. 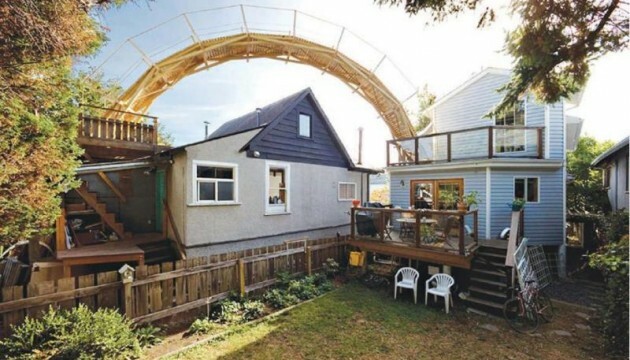 Bridge (Wooden Arch) (2006) was a functioning sculptural work reaching approximately four stories in height and spanning thirty-seven feet across, connecting two residential properties. The bridge arched across the property line from the upper balcony of one home up and over the roof of the neighbouring house, landing on its upper back veranda. Access to the bridge was offered twenty-four hours a day to visitors during the six-week period of the exhibition until the bridge was dismantled. Reece Terris’s work has been exhibited throughout Canada and the United States.